Each of the twelve electrocardiogram leads, records specific information from the different areas of the heart. Naturally, each lead provides more information from the nearest wall tan distant walls (electrically speaking). For example: the inferior leads provide more information from the inferior wall of the heart than the rest of the walls. That is why we group the leads of the electrocardiogram depending on the nearest heart wall. These groups have major relevance in ischemic heart disease. In acute ST elevation infarction, electrocardiogram allows us to locate the occluded artery, and in patients with previous infarction, Q wave locates areas of myocardial infarction. We can distinguish three groups of leads, which are anatomically correlated with anterior, inferior and lateral walls of the left ventricle. There is also another group that provides information on the right ventricle. Right leads, V1-V2: Interventricular septum and right ventricle. Anterior leads, V3-V4: Anterior wall of the Left ventricle. Low lateral leads V5-V6: Low lateral wall. High lateral leads I and AVL: High lateral wall. Inferior leads II, III and AVF: Inferior wall. 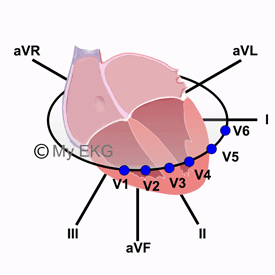 To confirm right ventricular abnormalities is recommended also make the right-side Leads (V3R, V4R, V5R, and V6R). Alterations in the posterior wall are seen in V1-V3 as reciprocal image. It is recommended make the posterior leads to confirm the information. In the next article we will further explain QRS complex morphology. Click on next down below to stay with us.